**Summary: Team Hobart started with 11 members from Ireland, UK and SA. The team was formed last year 2016 for their first participation to 94.7 Cycle Challenge in Joburg. The chosen charities were Just the one foundation and Goedgedatch Trust. **Story: First time for everything! 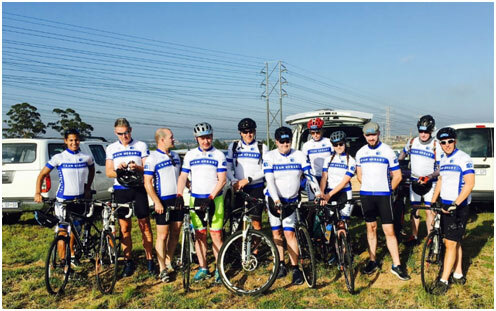 After purchasing bikes and training for a couple of month, the team flew to Joburg to take part of their first Cycle Challenge. Despite, the heat (especially for the Irish crew!) and the hills, everyone passed the finish line and arrived safe and sound. The aim was to raise funds for two worthy charities and about R81K were raised thanks to everyone efforts. During this trip, some of the team had the opportunity to visit the Orphanage Refilwe in Lanseria, close to the start line of the 94.7 Race. During this visit all realised that the charity was in great need for help and this is why Team Hobart is gathering again this year and has picked Refilwe Comminuty project as this year’s charity.